I was intrigued by your tip for using old iPods in this week’s Macworld podcast. Have you written exactly how to do that somewhere? Not in many years. It’s a technique I routinely showed off in the pre-iOS days when giving one of my “iPod Tips and Tricks” sessions. The gist is that a bootable iPod can be a very helpful tool when your Mac is refusing to start up or is generally misbehaving, and you’d like to boot it from another drive and use troubleshooting tools on the iPod to diagnose (and, you hope, repair) your Mac. The warnings of old are just as valid today. First of all, the iPod classic is not vented, so if you run the thing as a startup drive, it will heat up, which over time may shorten the drive’s life. For the kind of use I’m talking about here—running the iPod long enough to boot the Mac and run some tools—you should be fine. Just don’t run it as your regular startup drive. Second, the iPod classic as a startup drive is anything but speedy. Boot times are measured in many minutes. If you’re accustomed to booting your Mac from an SSD, you’ll find startup times dreadfully slow. Be patient and embrace the opportunity to experience computing like they did it in the old days. Plug your iPod classic into your Mac using the standard dock-connector-to-USB cable. If iTunes launches, quit iTunes. 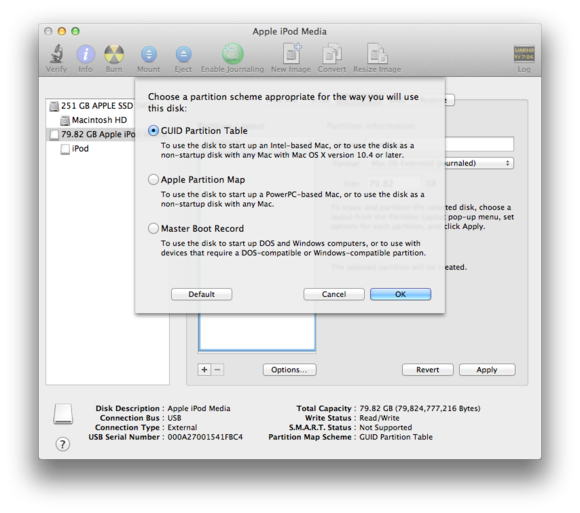 Launch Disk Utility (found in yourusefolder/Applications/Utilities). Within Disk Utility select the iPod in the list of devices in the left pane. To the right, click the Partition tab. From the Partition Layout pop-up menu, choose 1 Partition. When you do this, the Options button below the partition area will become active. Click that button, and in the sheet that appears enable the GUID Partition Table option and click OK. Then click the Apply button. Your iPod will be formatted so that it can serve as a startup volume. Formatting the iPod with Disk Utility. Now, locate the copy of the OS X Mountain Lion installer on your… What? You don’t have a copy because it was deleted after you originally installed Mountain Lion? Very well. In that case, launch the Mac App Store, click the Purchased tab, and locate OS X Mountain Lion in your list of purchases. Click the Download button next to the listing, and wait for it to do just that. Then you… What? You purchased a Mac with Mountain Lion preinstalled, and you don’t have a copy? That’s a bit trickier, but not so much trickier that our OS X installer expert, Dan Frakes, doesn’t have a solution. In his “Create a bootable Lion install drive for newer Macs” (yes, it says Lion, but it applies to Mountain Lion as well), he walks you through the fairly tedious steps for obtaining a copy of the OS X installer package. Regardless of how you obtain this installer, move it to a location outside of the Applications folder so that it won’t be deleted after it does its job. Launch the installer, choose the iPod as the installation target, and run through the installation as you would with any other drive. When the installation is finished, boot from the iPod and install any troubleshooting tools you wish to use. 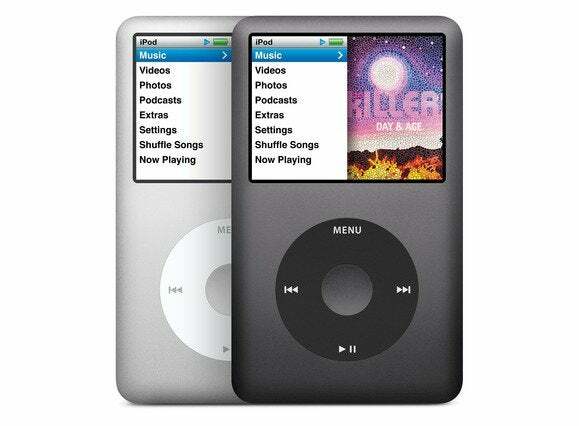 Restart the Mac, booting from that Mac’s regular startup drive, and tuck the iPod away for later emergency use.